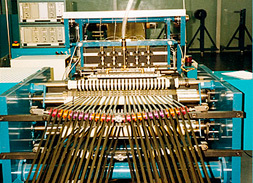 Centre winder with 4 individual rewind shafts which cantilever for unloading, each rewind has its own tension system and length counter which enables editing at the rewind station, the material shown is a security product of which every mm must be accounted for. 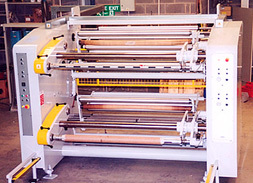 SC-1300 A simplex centre-rewind slitter specifically designed for papers and board conversion, the lay-on head assembly is complete with rotary shear slitting, bowed spreader roller, lay-on roller which is weight counter-balanced, the machine standard is 500 mpm rewind diameters, 1300 mm web widths up to 100 mm, machine is equipped as standard with unwind and rewind reel lift in / out devices. 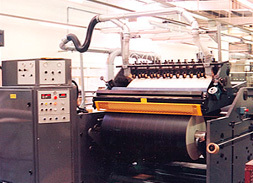 Ultrasonic slitter for light lock velvet, prevents possible fraying of woven materials, tapes are rewound onto a multi-head traverse bobbin rewind system. Duplex Turret rewinders for extruded film. 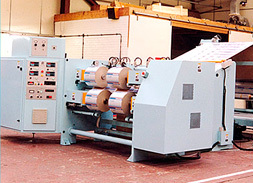 This unit was supplied to work in conjunction with a film extrusion line, twin turreting rewinds, integral dancer roll accumulation unit, machine will accommodate rewound rolls of 500 mm per shaft, zero speed cut. 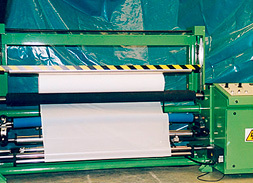 SR-800 Simple surface driven rewinder for rewound rolls up to 800 mm diameter web widths up to 1800 mm, incorporated pneumatic rider roll, shaftless rewinding.